Tel Aviv: The world will hold its breath this weekend as Israel and West ISIS will do battle for a shock place in the World Cup semi finals, after both teams overachieved in the group stages. The tense clash will be the first time the Zionist nation has gone head to almost-head with West ISIS, who surprisingly topped the Caliphate group after a penalty shootout win against Al Qaeda…when the opposition goalkeeper was beheaded during the coin toss. After losing 5-1 to East ISIS in the opening game, the signs weren’t good for West ISIS, whose entire midfield was hurled into the stands after the linesman was blown up for raising the wrong flag. Managed by Kassam Allardyce, they switched the formation to play 10 up front and one lookout at the back after a poor back pass saw a central defender hit on the head by a flaming vuvuzela. That formation worked as they sneaked through the group stages with wins over Al Nusra and Boko Loco before clinching top spot in an eventful win over Al Qaeda. 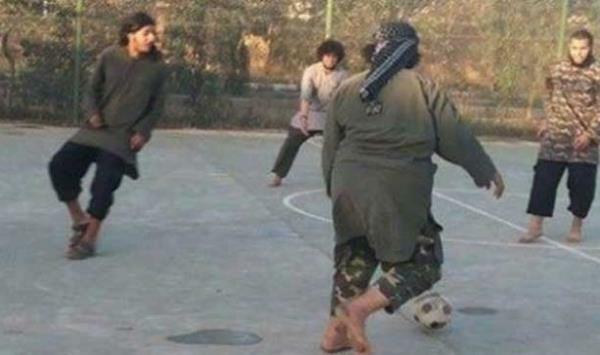 Trailing one nil, West ISIS controversially equalised in stoppage time when an in-swinging corner found super sub Jihadi Ringo, who had only put on his suicide vest moments before. He nodded the ball goalwards. The keeper palmed the ball away but the striker’s head flew in, along with two fingers, a right elbow and a knuckleduster. As ISIS fans celebrated by singing Liverpool FC’s ‘You’ll never walk alone‘, the opposition fans began to chant ‘You’ll never walk again‘ so the referee awarded the goal before he was assaulted by irate tea vendors. Israel’s qualification was more routine as they coasted through, under the management of financial wizards Ehud Olmert and Aryeh Deri. Opposing managers were paying shekels into their offshore bank accounts while the Israeli attack scored freely. Israel thrashed Lebanon 6-0 when they turned the floodlights and water off after hearing of a rocket fired at Haifa. The Zionists romped past the Future Palestinian State, 9-0, after Israel’s Egyptian coach Sissi executed the substitutes bench, which was being used as a grenade factory. The BBC called for an immediate boycott, running with the headline: ‘Palestinian heartbreak as Israel steals football glory‘. Oddly, there are plenty of tickets still on sale for the Israel-ISIS clash at the stadium in the central Asian republic of Icouldntgiveaf–kistan. As TV networks booked flights out of the country, ex FIFA president Sepp Blatter promised security would be as tight as his wallet and as comfortable as his padded cell in Switzerland. The football pilgrimage is expected to see Israel bring 25,000 fans including the publicity-shy supermodel Bar Refaeli. It is unclear how many ISIS fans will come until the end of a three-week gun battle in Palmyra. Available at http://www.armageddon.com (strictly a fanciful jest!–The Freier Legal Department), tickets start at $5 and include a souvenir program, a light beer and funeral expenses.